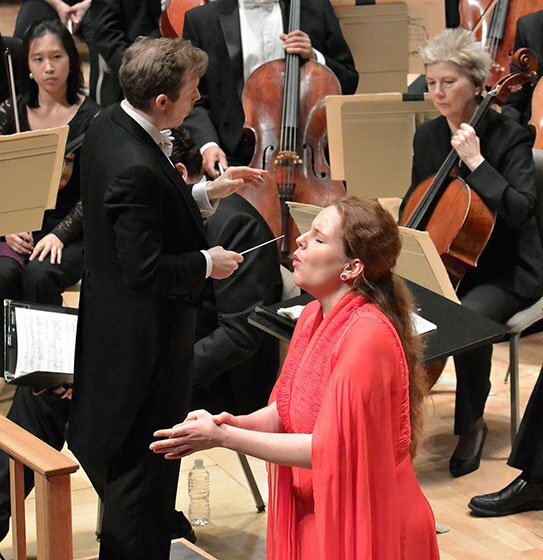 On Thursday night, with the first hint of winter in the air, the Boston Symphony Orchestra presented the American premiere of Mark-Anthony Turnage’s Speranza for orchestra and Gustav Mahler’s Das Lied von der Erde. When I first sat down at Symphony Hall and looked at the program I thought that an orchestra piece in four movements, with each movement titled “Hope” in a different language, was just what I needed to hear on this cold and windy night. However, within the first few moments of the first movement I realized that Turnage was going for a different idea. Instead of a positive message, Turnage’s work is more reflective of Nietzsche’s Hope, which he described as “the worst of all evils because it prolongs the torments of man.” One assumes that Turnage’s hope is associated with the long mournful notes that he scored for the duduk (an Armenian reed instrument played wonderfully by Martin Robertson) and that struggled to be heard throughout. Concerning tempo, Turnage’s work is odd in that the first, second and fourth movements are slow, melodic and contemplative while the third is a punchy and jazz influenced scherzo. The first movement “Amal” is marked by its lush orchestration, dense chromatic (but largely tonal) harmonic organization. The movement’s lyrical secondary theme is particularly dramatic, with its brief references to the blues, leading to the movement’s climax through a series of pounding, crescending descents. In the second movement, “Hoffen,” the bass drums return, accompanied by threatening harmonies and contrasted by the lamenting duduk, which, after a transcendent chorale section, returns to close the movement. In the raucous and rather dark third movement scherzo, “Dochas,” Tornage’s syncopated melodic ideas were remarkably disturbing. The final movement, “Tikvah,” opens with a nostalgic theme in soprano saxophone that provides a strong sense of relief to the preceding movement and leads to a shimmering central section. Finally, the symphony closes with the duduk’s return. Overall, the piece’s expression is just too heavy: Too heavy for its title and too heavy for a cold autumn night. Apart from seeming to struggle in the third movement, the BSO performed very well under conductor Daniel Harding’s baton. It was clear that he was well acquainted with the piece, having been present when it was commissioned and conducted at its world premiere by the London Symphony Orchestra in 2012. The work is in six movements, alternating between performances by alto and tenor, performed Thursday by Dutch mezzo-soprano Christianne Stotijn and Canadian tenor Michael Schade. When they first came on stage, I was struck by how well matched these two very tall singers were with a kind of ying-yang stage presence. When Schade sang, with his score in a black three-ringed binder, his expression was one of earnest ambition contrasted to Stotijn as she sat in quiet reflection. Alternatively, when Stotjins sang, in all but the last movement she sang from a mini-score which, accompanied by her serene and graceful gestures, gave the impression that she was reading not from a score, but an ancient, sacred text. And while Stotijn sang, Schade seemed incapable of sitting still, looking around, rocking to the music, with a furrowed brow and a sincere intensity. In the first movement, “Das Trinklied Vom Jammer Der Erde” Schade seemed to have some trouble getting heard. The part, which is written abnormally high and against a loud and huge orchestra, tests the limits of the singer both in terms of volume and range. However, by the first iteration of the famous refrain “Dunkel ist das Leben, its der Tod!” (Dark is life, is death!) Harding had brought the orchestra into hand, an appropriate balance was achieved and Schade’s ringing tenor came through. Overall, the orchestra’s performance in the first movement, and the next four, was rather disappointing. It seemed cold and marked by disinterest. However, Schade, and even more so Stotijn, seemed to make up for this. Her full and slightly dark instrument gave a warm, knowing nostalgia to Mahler’s lines and by the orchestral interlude in the final movement and its transition into the last verses, Harding and the orchestra seemed to find their voice. At Stotijn last “Ewig” as the orchestra faded into the silence the audience responded with a standing ovation, which, if not merited by the performance as a whole, was certainly merited by the recovery at the transcendent ending. Indeed, as I stepped outside after the concert, I realized that I had forgotten to put my coat on. Indeed, by the end of the second half I’d forgotten how cold the night had become.